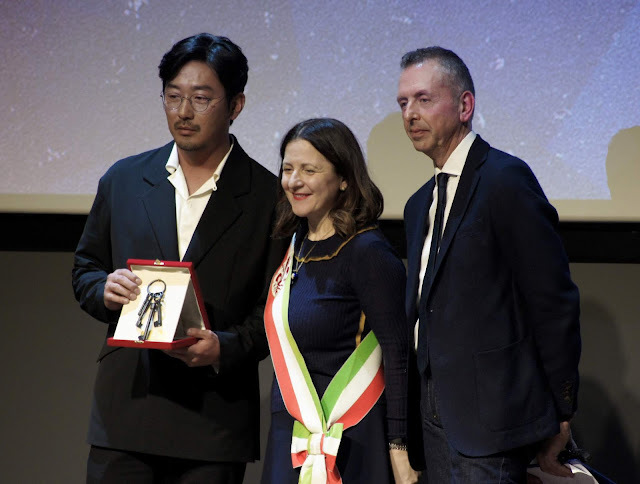 Ha Jung Woo has also received a cultural award from the Italian city of Florence for his contribution to the film industry as an actor and director. The "Key to The City" also makes him an honorary citizen, he is the second Korean honored by the city after Park Chan Wook. Q: You're what we can call a "child of the arts" (your father is actor Kim Yong Geon), did you decide to take on acting because of him? And what advice did he give you? Q: One of your most successful interpretations is definitely the serial killer in The Chaser, what made you choose to play such a complex character, especially with it being the debut film of Na Hong-Jin? HJW: When I got the script I was very fascinated, considering that it is a real news story. It's true that it was the first movie by Na Hong-Jin but I also consider it my first one. As soon as I met the director I perceived from his enthusiasm that the film would be a great success, and so it was. Na Hong Jin is a very attentive and focused director and this aspect of his character convinced me to participate in the project. I am of the opinion that there is no perfect script, but there is perfect group work between directors and actors, this is the secret to a good film. Q: Continuing the talk about important directors, you worked with one of the greatest Korean directors of the moment: Park Chan Wook. HJW: Working with Park Chan Wook was a great experience. Both as director and as a man he is a great professional. 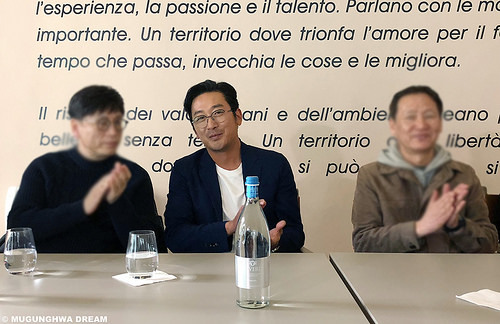 In order to play Count Fujiwara I took intensive Japanese lessons for three months with weekly table reading, Park Chan Wook is very meticulous and attentive to every detail, to think that to shoot the comment for the DVD it took us eight hours ( laughs)! Every time he made us stop to record again I thought 'This man is not normal' (laughs). Seriously, I'm not surprised at his success, he's a real professional and an artist like him can only succeed. Q: In your almost twenty-year career you have worked with many actors and directors, what is your dynamic with these artists? 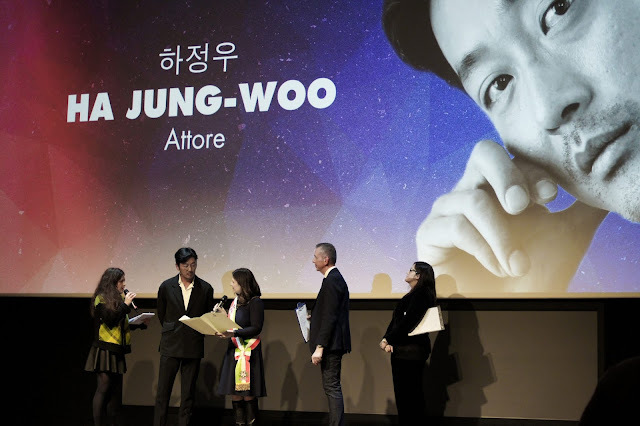 HJW: One of the most important things about this work is to find the right working balance with directors and actors, and after these years I can say that all the directors I met and the actors I've worked with have created the Ha Jung Woo of today. Q: There are many roles you have played during these years, which character you've found yourself most at ease with? 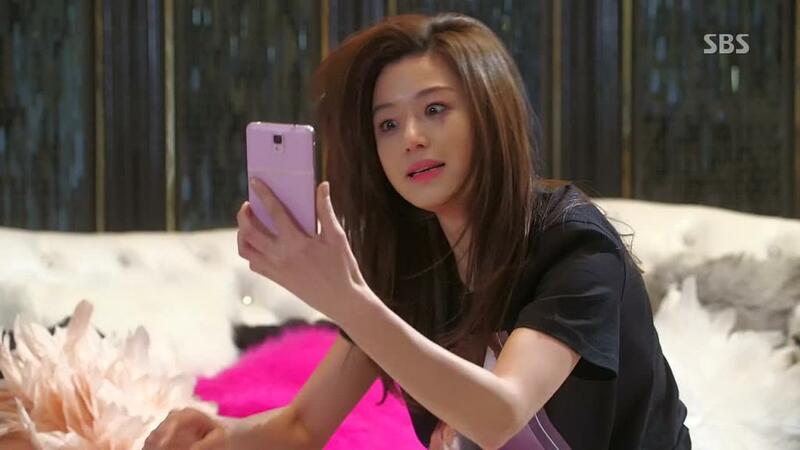 HJW: Yes, I've played very different characters, but I have to admit that one of my favorites is Cho Byung-Woon (My Dear Enemy). It was a lot of fun to play him, he's a very simple character, but he's got a very complex personality. Q: You've taken part in small, medium and large productions and you often shoot movies close to one another, how do you prepare yourself? HJW: I have been an actor since 2005, and I do it because I enjoy it and I have great passion for it, this is the basis of my preparation. At a technical level, before starting to work on a character I talk a lot with the director and I try to create a climate of harmony with the rest of the cast. Once I find that perfect balance between the director and the cast then I can start thinking about my characters; in the end they are all human so I wonder how it is possible that they behave in that particular way. Q: The "Ha Jung Woo Mukbang" has become very popular online; it's the way you eat in your films. HJW: (laughs) That's true, I do not know where this thing started from, but it is true that in every film I eat and many have pointed out to me that when I do it it seems that all I eat is extremely tasty. Often when I'm in the restaurant I see that many people are looking at me, now I feel everyone's eyes on me every time I eat (laughs). In each movie, they insert a scene in which I eat, I do not know why, when I started filming "The Handmaiden" I thought that at least Park Chan Wook would not have gone there and instead he added a scene where I'm eating fish. Q: You're not just an actor, you're also a director. HJW: Yes, I have always dreamed of combining a director's career with that of an actor. So as soon as I finished shooting "The Berlin File" I decided that I would make a film as a director. In two months the screenplay for "Fasten Your Seatbelt" was born, the film did quite well. Unfortunately my second film, "Chronicle of a Blood Merchant", did not go so well. Now I'm working on a third film as a director.